The Aberdeen Western Peripheral Route/Balmedie to Tipperty (AWPR/B-T) is one of the largest infrastructure projects in Scotland. It is being delivered by Transport Scotland on behalf of the Scottish Government in partnership with Aberdeen City Council and Aberdeenshire Council. The contract was awarded to the Aberdeen Western Peripheral Route Construction Joint Venture (AWPR Construction JV) formed with Balfour Beatty, Morrison Construction and Carillion to deliver the project to completion. The 28-mile, £745 million project runs from the north side of Stonehaven to Tipperty by Ellon and is expected to open in autumn 2018. It consists of four sections with grade-separated junctions and two major river crossings with numerous water courses to be culverted beneath the alignment of the new carriageway. Over the past two years Groundforce Shorco has worked very close with AWPR Construction JV and specialist sub-contractors to provide the project with temporary works design solutions to supply, traditional and bespoke schemes for the drainage infrastructure, water course diversions, bridge structures and high pressure utility diversions. In addition to the shoring and associated SiteSafe product range our Stopper Specialist Division was highly utilised throughout the project. At Goval near Dyce, which was one of the major sections of the project, included the construction of several new bridges and the realignment of two important commuter roads. Construction also included a water course diversion that required the installation of large box culverts. As part of the significant works being undertaken to ensure the indigenous wildlife can safely access either side of the new road once it is open, the culverts have been equipped with special mammal ledges to allow otters, badgers and foxes unrestricted access without being at risk from road users. 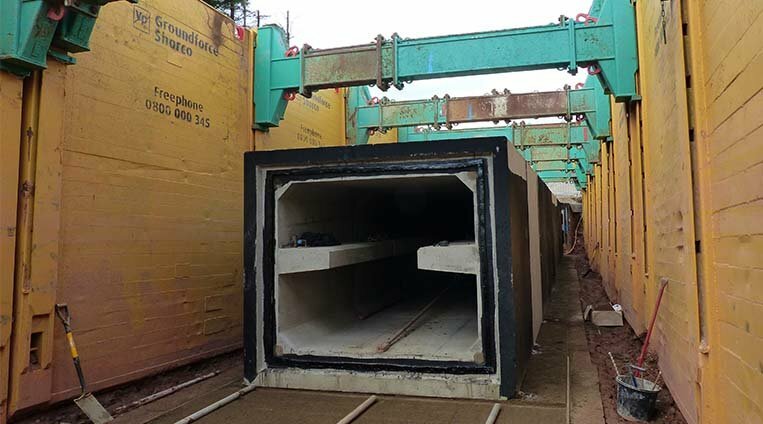 Groundforce was tasked with producing a cost-effective and safe shoring solution for the culvert installation that would provide a 6m high and 5.5m wide clearance to allow AWPR operatives to install the culverts quickly and safely. The alternative would have been to dig out a 30m excavation - something the contractor was keen to try and avoid as working in such wet conditions would have required more operatives working within the excavation and extend the build programme. Groundforce Shorco’s proposed solution was to supply the company’s Rolling Strut Boxes and tops. With a 3.1m vertical strut high clearance and 6.24m maximum internal width (which exceeds the range of traditional box systems) they are ideally suited for the installation of large diameter pipes or culverts. They are also an off-the-shelf item so they can be supplied quickly and direct to any site as required. The benefits to the client of using this solution meant that not only did it greatly accelerate the works to the extent they could then use the boxes on other sections of the project, but it also resulted in a much safer working environment. Groundforce Shorco also supplied a comprehensive range of products from its Stopper Specialist division which included traditional air test for carriageway drainage ranging from 300mm – 1000mm diameter, stoppers for flow control via blanking and by-pass facilities to over pump/flume and high pressure testing to the Aberdeen water supply. From the SiteSafe products portfolio, equipment included EdgeSafe, a lightweight mesh barrier system designed to provide light-duty edge protection to trench boxes and piled structures; StepSafe, a temporary, self-levelling site stairway was also highly used at bridge structure sites with fall arrest and rescue recovery provided via the Groundforce FallSafe Davit Arm system. Piletec, also part of Groundforce supplied Culvert Pullers for the various water courses to be diverted via pre-cast box culvert units to pull the units into position, some >15 tonnes to create seal. Excavator Mounted Vibrators (EMV’s) were employed during the installation of very complex Scottish Water asset diversions at Milltimber and Kingsmills along with high pressure gas main diversions beneath the live A96 carriageway. John Cowie from Groundforce said: “Through working closely with AWPR Const JV and sub-contractors and with the technical expertise, Groundforce Shorco were able to fulfil the requirements of the contract from its strategically positioned Aberdeen depot providing the timely cost effective solutions expected to meet the demands of the contract". Groundforce Shorco are proud to have served the project and ultimately the surrounding communities to assist in the economic growth over the coming years.